It’s been a long and meandering road for the adaptation of Robert Jordan (real name: James O. Rigney Jr) fantasy epic The Wheel of Time. The 14-part novel series, which concluded with the release of A Memory of Light in 2007, has flirted with the small screen before when Jordan’s widow, Harriet McDougal, revealed that the legendary property had landed at a major Hollywood studio. We now know that studio to be Sony, and we understand the company has partnered with Red Eagle Entertainment and Radar Pictures to do good on that initial vision. First reported by Variety, and later confirmed by IGN, the serialized spin on Wheel of Time has appointed Rafe Judkins (Agents of SHIELD, Chuck, Hemlock Grove) to write and produce, with Harriet McDougal on board as a consulting producer. 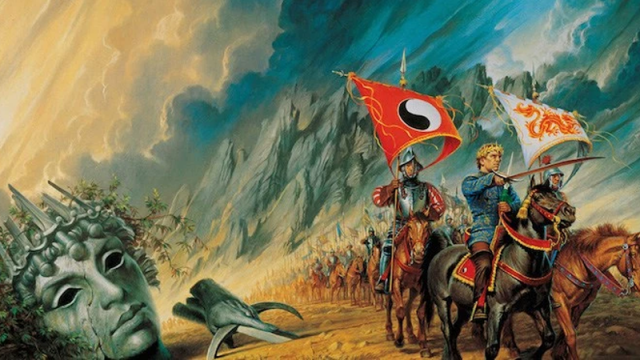 The importance of her involvement can’t be overstated, either, given McDougal served as an editor on Wheel of Time for years and therefore has a deep understanding of its world and fantastical story. The producer has blamed legal issues for the lengthy pre-production process, and you’ll be able to get a better sense of the behind-the-scenes drama via McDougal’s recent Google+ post. Story-wise, we know that Robert Jordan’s sprawling epic follows “the quest to find the Dragon Reborn, who it is said will help unite forces to combat The Dark One.” It’s a classic yarn of good versus evil told across 14 fantasy tomes, so the big question for Sony is how to engineer that saga into compelling television. Can it reach the dizzying heights of Game of Thrones, for instance? The Wheel of Time is officially a go at Sony, and we’ll be bringing you all the latest developments as more information comes to light.